Rattan is one of the most durable jungle products found until today. 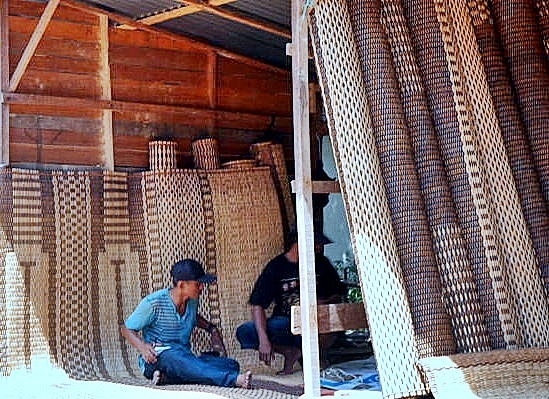 Whole longhouses can be put and hold together by a single string of rattan – a palm species, which trunk is bendable and suitable for weaving. And don’t forget the ever popular Sarawak rattan mats – not only are they comfortable, they are also beautiful and of high quality. Woven rattan baskets are made of different jungle creepers, fibres, stems and leaves for the usage in the daily life of tribal people: storing paddy seeds, harvesting, gathering of jungle vegetables and fish traps. * Nuran ak Jawa, Rh.Sap Batu Lintang Undop, 95000 Sri Aman, Sarawak.